It is only a few decades ago that the connection between human genes and disease begun to unravel. Back in 1952, it was Rosalind Franklin's diffractive x-ray imaging that first revealed contours of the very origin of life: the DNA molecule. Your body uses nutrients in order to function, grow and regenerate. But what is it that controls this unimaginably complex process? The answer lies in the ability of special complex molecule in the midst of every human cell - called DNA molecule - to initiate reactions from which other molecules are made. Through an enormous number of inter-related sequences, it builds a complex organism, such as your body, and controls its functioning. These complex molecules creating and maintaining life are known as DNA (deoxyribonucleic acid). DNA molecule consist of a pair of long helicoidal strands made of deoxyribose (sugar with five carbon and four oxygen atoms) molecules, bonded to phosphate groups, which are attached to a pair of nucleobases - adenine, guanine, cytosine, and thymine - connecting the two strands. The first two nucleobases are purines, and the other two are pyrimidines. The bases themselves are synthesized from multiple components, including those obtained by amino acid degradation and sugar metabolism. 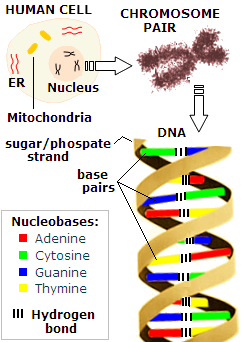 Each nucleobase-sugar bond forms a nucleoside; adding the phosphate group, which connects to the sugar groups of the nucleosides in the DNA strand, forms nucleotide, sub-molecule of the DNA nucleic acid - a macro-molecule composed of chains of nucleotides. Each purine and pyrimidine base, linked by hydrogen bond, is called base pair. Specific order of the four bases along the DNA strand forms genetic code. Sequences of this code replicate into an RNA (ribonucleic acid, a slightly different, single-strand form of nucleic acid, with the sugar group in its strand being ribose, and thymine replaced by another pyrimidine derivative, uracil) segment, in a process called transcription. These RNA segments - so called messenger RNA - move from the nucleus to cytoplasm, where corresponding proteins are made from their code in a process called translation. These proteins are used either as tissue building blocks, or for body's regulatory and metabolic processes (hormones, enzymes, etc.). A sequence of three base pairs (codon) is needed to produce an amino acid. Large number of subsequent pairs forms the gene - a DNA sequence regulating certain body function, or a part of it, through proteins it expresses via RNA. Human body has as many as three billion base pairs, forming up to 100,000 genes (most recent counts put the number considerably lower, at around 30,000, but it may still be grossly incorrect, due to unreliable methodologies of identifying individual genes). However, only about 3% of them appear to constitute the coding (i.e. with the transcription capability) part of the DNA. The rest of it - sometimes affectionately called "junk DNA" - still might have some role in the DNA regulatory function. Genes vary greatly in size, containing anywhere from 20,000 to over a million base pairs. All gene-containing DNA strands are bundled into 23 chromosome pairs inside the cell nucleus. They constitute genetic code, a complete set of chemical information needed for the formation and functioning of each body cell and, by that, the human body as a whole. Not all the genes are active in all body cells. Which genes are active, and which are turned off ("silenced") depends on the cell type, as well as its activity and environmental exposures. Beside controlling cellular and body processes, genes also control life and death of the cell itself. Chemical reactions initiated by genes require energy. It is provided by tiny cell organelles called mitochondria (which have their own DNA/RNA, and can independently produce proteins), either directly from glucose, or from fat/glucose/energy conversion. In order to keep this production process clean and safe, the cell uses its own protective detox apparatus, the major part of which is in endoplasmic reticulum (ER). Its enzymes chemically change toxins, either to have them directly neutralized, or to modify them so that a special protein molecule - such is glutathione - can be attached to carry them out to one of the channels of elimination (most cells have some degree of detox capability; this is in addition to the liver detox function, as an organ specialized to filter toxins out of blood coming from the digestive tract). Clearly, your body needs both, good nutrition and efficient genetic make up in order to maintain health. The two are mutually dependant. While the efficacy of nutrient utilization depends on the genetic code, the code itself needs good nutrition to fulfill its function, and to be optimally protected from damage by oxidation or toxins. In fact, the more compromised your genetic base, the more important becomes optimized nutrition. Scientists are in the process of deciphering genetic code through so called sequencing. It requires connecting specific structure of the DNA base pairs and resulting set of genes with their function in the body. The first living form whose genetic code - or genom - was sequenced back in 1977 was a virus, with only nine genes in a single chromosome 5,375 base pairs long. Decade ago, in 1996, a 16-chromosome genom of baker's yeast was decoded into 12 millions base pairs and 6,000 genes. These successes make easier deciphering the human genom, because we share majority of genes with less complex life forms. It is expected that in a decade or two it will be possible to determine individual human genetic codes. It will take somewhat longer to understand a complete 4-dimensional mechanism of its inner workings, but it is also in the foreseeable future. This will open new era in the prevention and treatment of diseases, and beyond. The merciless killer born from DNA damage - cancer - would be eradicated, just as it has happened to smallpox virus. Specific gene mutations contributing to a number of cancer forms are already known. Most cancers result from the cumulative effect of several damaged genes, altering the way in which affected body cells live, multiply and die. It is sort of a "cancer code" that needs to be completed before the disease sets in. This is why it usually takes long time for cancer to develop. Following the same logic in reverse, it may be enough to correct only a single digit in the cancer code - that is, a single source of genetic damage - to conquer the disease. Hereditary diseases, like cystic fibrosis, muscular dystrophy, hemophilia, and others, will be ultimately fully correctable. This includes brain related diseases, like schizophrenia, which often times has hereditary component. Huntington's disease, causing death of brain cells, is a result of defective IT-15 gene. This 200,000 base pairs long gene is located on the short arm of the chromosome 4. When a small sequence within it - normally from about 30 to 100 base pairs long - is longer than about 120 pairs, the disease takes place; the greater extra length, the more severe it is. Learning to read and manipulate genetic material of humans and small invading organisms is the only hope for being able to neutralize emerging new killer-viruses and antibiotic-resistant bacteria. The reason HIV virus is so hard to conquer is its fantastic rate of mutation. While its "default" RNA of 9,200 base pairs, forming 6 genes, is known, constant mutations within its genetic material rapidly produce alternative forms, resistant to every initially promising treatment thus far. But the key to winning this battle lies in the genetic code of the virus. At present, main obstacles to the application of gene therapy are related to body's immune-response (either to the carrier of corrected gene, most often a modified virus, or to the cells with new genetic code), ensuring sufficient number of modified cells and their efficient multiplication, as well as its high cost. There are some encouraging experimental results, but it will take years, at best, before it will be used to cure human diseases, even in a very limited manner. Beside curing diseases, molecular medicine should be able to find ways to significantly slow down aging, or even re-grow new organs and body parts. Among other futuristic achievements, such is the possibility of correcting one's reproductive genes - in fact, designing children - may be only a few decades away. The only limit to the possibilities of genetic medicine will be likely set by ethical standards in manipulating human genetic material. While molecular/genetic medicine brings great promise for much more efficient diagnosing and correction of the actual causes of human disease, the three pillars of health - adequate nutrition, minimizing toxic exposure and active, positive lifestyle - will remain as important to your health and wellbeing as they are now.